This week she is showing what is in her purse. I think last week might have been about make-up, so bonus for me cause ALL my make-up is in my purse…sad, but true. And you guys can thank me later cause I just cleaned out my purse last week. So no smashed goldfish or extra pacifiers. Yes, it’s still shocking to me too that this much crap is in my bag after I cleaned it out. 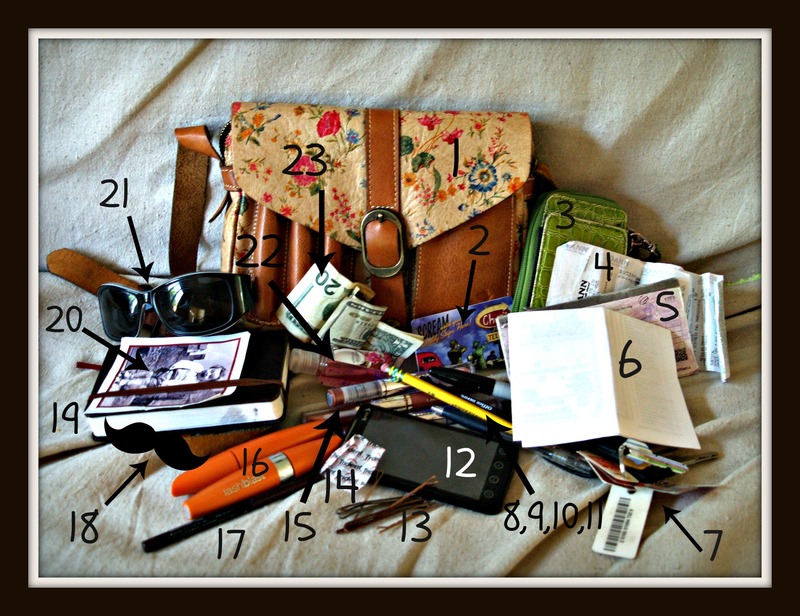 1) my purse: which I LOVE!!!! I was sad to have to retire my most favorite pleather bag from Target, but this little number makes me happy. 3) My all-time favorite wallet/wristlet because it has a place to hold my phone and a clip for my keys. It may not be the most attractive thing, but when i need to run a quick errand, I just grab that and go. 15) 3 tubes of Cover Girl Outlast Lipshine: 2 of them are #310 Sleek Suede and then I got all adventurous the other day and thought I’d try a new color #245 Berry Blast…that was a mistake. So there you have it folks. I know you’ll be able to sleep better at night now.